The Iraq edible oils and fats market is surging on the back of several favorable factors. Firstly, rising demand for high quality edible oils has led product manufacturers to develop products that have high nutritional content and high smoking points. High quality edible oils are rich in vitamin E, monounsaturated and polyunsaturated fat, and omega-3. The increasing consumption of processed food that are oil based is also fuelling the Iraq edible oils and fats market. However, factors such as decades of war and political instability leading to weak economic growth is challenging the growth of this market. Nevertheless, with economic revival and growth of the tourism sector, the Iraq edible oils and fats market is predicted to receive a boost. Considering a number of favorable factors, the Iraq edible oils & fats market is expected to clock a CAGR of 6.0% between 2017 and 2025. The Iraq edible oils and fats market is segmented on the basis of product type, distribution channel, and region. Depending upon product type, vegetable and seed oil, spreadable oils and fats, cooking fats, and other are the segments into which the Iraq edible oils and fats market is divided. Of them, vegetable and seed oil dominated the overall market in the past years; the segment is predicted to hold the leading share in the near future. The vegetable and seed oil segment is further sub-segmented into soybean, sunflower oil, palm oil, corn oil, and canola oil. Vis-à-vis revenue and volume, sunflower oil is expected to retain dominance through 2025. Spreadable oils and fats segment is anticipated to display a marked increase in its market share between 2017 and 2025. The spreadable oils and fats segment is bifurcated into butter and margarine; of the two, butter currently holds the leading market share. 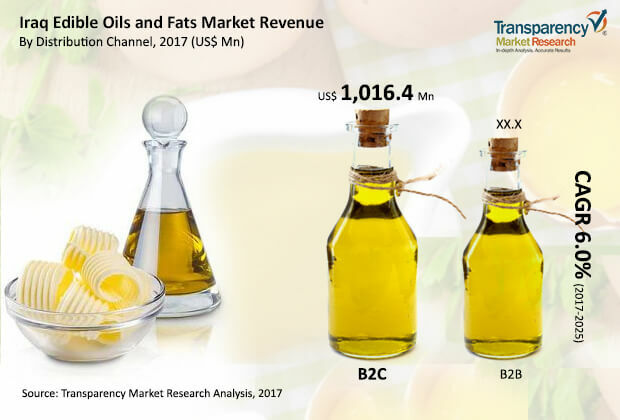 Vis-à-vis revenue, cooking fats segment of the market is anticipated to be valued at US$385.0 million by the end of 2025. Cooking fats segment has been bifurcated into animal ghee and vegetable ghee, where the latter holds dominance in terms of both revenue and volume. In terms of distribution channel, B2B and B2C are the segments into which the Iraq edible oils and fats market is divided. Of the two, B2C leads in terms of revenue contribution to the overall market. The sub-segments of B2B include HoReCa and others. On the other hand, the sub-segments of B2C include PDS and others. Region-wise, the Iraq edible oils and fats market has been bifurcated into Babil, Basra, Baghdad, Dhi Qar, Al- Qadisiyyah, Diyala, Maysan, Karbala, Najaf, Muthanna, Wasit, Arbil, Kirkuk, Sulaymania, and others. Baghdad is anticipated to account for the leading revenue contribution to the Iraq edible oils and fats market through 2025. Baghdad being the largest city along with high population and substantial GDP are key factors behind the growth of Baghdad edible oils and fats segment. Sulaymania, Basra, and Babil are other key regions to account for significant share of the Iraq edible oils & fats market. Leading companies in the Iraq edible oils and fats market to name are Marsan Gida San Ve Tic A.S., Anadolu Group, Aves A.S., Keskinoglu, Altunkaya Group of Companies, Yildiz Holding, and Zer Group among others. Transparency Market Research’s comprehensive market study on the Iraq edible oils and fats market aspires to serve as a valuable business decision making tool. The report provides a comprehensive analysis of the Iraq edible oils and fats market for the 2017-2025 forecast timeframe with 2016 as the base year. The report provides an analysis of industry trends and growth indices in each of the segments over the aforementioned forecast period. This helps market stakeholders to gauge the growth behavior of each of the segments in this period. Following this, the market looks into vital market indicators which includes drivers, restraints, and opportunities expected to influence the growth of Iraq edible oils and fats market through 2025. The study also looks into other key aspects that could influence the growth of this market. Moreover, the study explains the penetration of each and every segment within various geographies and how these segments have boosted the growth of the overall market. The report comprises an analysis of macro-economic factors at the state level that are essential to arrive at insightful findings. The detailed ecosystem analysis of macro-economic factors aims to provide a cross-sectional overview of the Iraq edible oils and fats market. The study incorporates market attractiveness analysis, wherein market segments based on product type, distribution channel, and region are analyzed based on their market share and revenue contribution. The study provides a significant overview of the Iraq edible oils and fats market by segmenting on the basis of product type, distribution channel, and region. The competitive outlook of the Iraq edible oils and fats market presented herein is a highlight of the report. This includes identifying key players along with a detailed competitive profile of each of them. Insights into key players’ winning strategies and competitive hierarchy until the end of 2025 are also presented herein. The report is a result of perfect combination of primary research, secondary research, and in-house expert insights. Secondary sources reached out to include but are not limited to annual reports, investor presentations, company websites, national government documents, SEC filings, internal and external proprietary databases, company specific webcasts, news articles, government publications, and industry white papers. Primary research involves reaching out to industry experts and opinion leaders via e-mail interactions, telephonic interviews, and face-to-face interviews to validate assumptions, findings, and analysis of the Iraq edible oils and fats market. Primary interviews help to obtain valuable insights into crucial aspects such as market dynamics, growth trends, competitive landscape, market size, etc. Insights thus received help to validate and reaffirm secondary research findings. Moreover, the data collected and scrutinized from primary and secondary research phase is further analyzed by our in-house experts. The market study includes profiles of companies having significant presence in the Iraq edible oils and fats market. Market players have been profiled for their competitive attributes of product portfolio, financials, recent developments, and SWOTs.